Clenea Baby is the brand that establishes a new level in quality of baby wipes, with an efficient alcohol-free product, and a formula suitable for the skin of newborns. To synthesize these advantages, Keenwork created a name that inspires care, efficiency, and affection. The logo was designed with precision and delicacy, conveying confidence and quality. The strategy was to create a visual language that stands out among competitors, and breaks the paradigms of the category, that usually uses photos of baby’s and mothers. 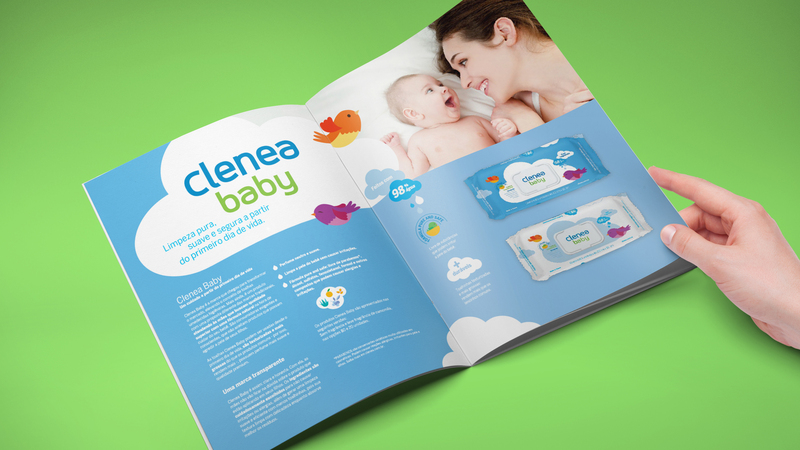 The playful and delicate theme of clouds and birds was combined with highlighted information on the product’s composition, which makes Clenea Baby unique in the market. 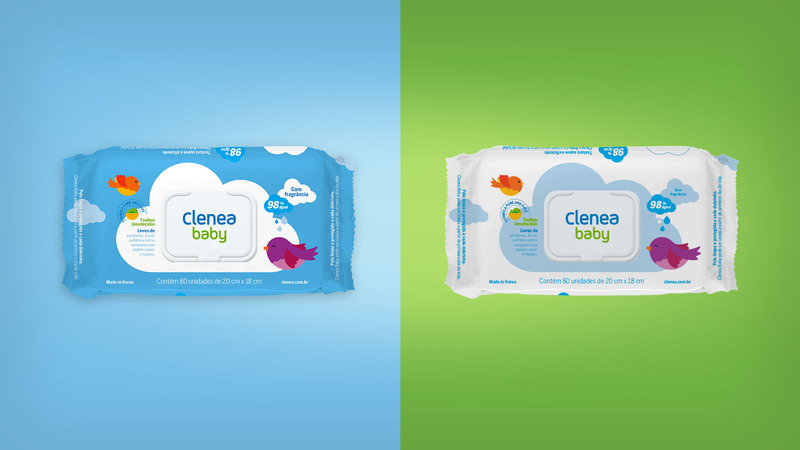 Clenea Baby is a young, honest and modern brand that has brought to Brazil a new concept in baby wipes. Because it is different from other brands, as the product is free of substances that can irritate the baby’s skin, its communication should also differ from the standards of the category. A graphic language, which appropriates delicate elements of the sky – clouds, birds, and water – builds an atmosphere of comfort and cleanliness that innovates thanks to its clarity and simplicity. The entire process included the creation of naming, visual identity, packaging, and communication materials. The whole graphic language of the brand is supported in the construction of a universe of care and efficiency, associating curved elements and a soft palette of colors to the clear and didactic description of the product’s differentiators. The proprietary graphic language is the result of an in-depth study of the brand and codes of the category. Organized and simple elements bring peace of mind to parents looking for efficient and safe products for baby care. Without neglecting proximity, Clenea Baby unites these concepts in its packaging line, innovative in its niche market.